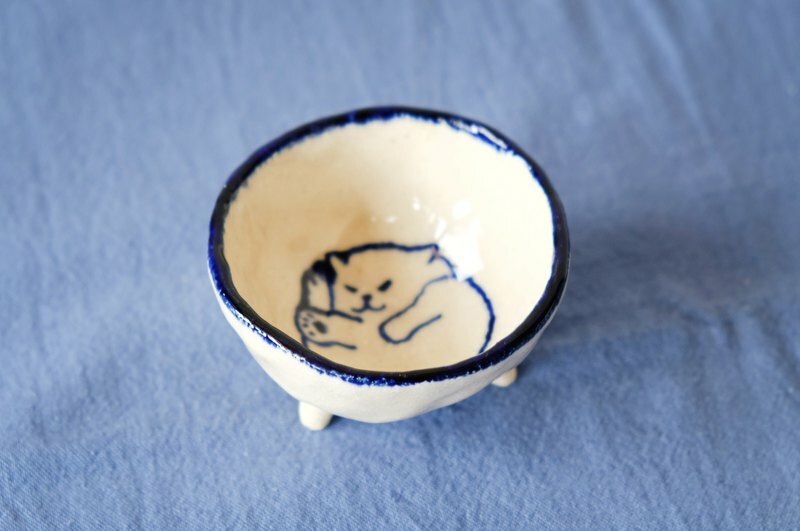 喵呜～～ Three-legged white cat saucer, can be loaded with sauce or with a small snack After eating, you can see that the kitten is lazy and has a good heart The hand-picked saucer has a different hand feel than the neat, leaving the feel of the production. We personally painted the black and white enamel on the cup one by one, hoping to spread the temperature of our production to everyone's life. This time uses a white clinker clay that is different from the previous ones. The texture is slightly yellow and white with white particles. If paper is used, this soil may not be as bright and vivid as the copper plate paper is printed on. Instead, it is closer to beer paper or a fine-feeling art paper. The texture of the texture is very simple and rich, adding a touch of texture. https://c1.staticflickr.com/1/799/40884773524_7cb0c3354d_b.jpg https://c1.staticflickr.com/1/852/40884773934_22b8a224dc_b.jpg https://c1.staticflickr.com/1/893/41595623151_507b0320e0_b.jpg https://c1.staticflickr.com/1/874/41595628581_8e1fa1f6a1_b.jpg https://c1.staticflickr.com/1/892/41595625501_d80c1b3276_b.jpg ///// **Materials |**White clay (with clinker) / Fired at 1230 degrees **Size |**Diameter 9cm / H 5.5cm **Commodity |**Black and White 喵 Small Saucer One (does not include other shooting props) **Intimate Reminder|**Products are made by hand. There will be slight differences in size (+-10%). The earth/glaze color will also vary slightly depending on the soil/steamer. Hand-made products are not mass-produced in large quantities, and the size/glaze color is more difficult to be identical. Please think carefully before buying. ///// **Use and keep clean |** * Pottery work is fragile. Please move to avoid collision. * Works made of high temperature, wipe or wash with clean water. * Due to the design or firing method, the bottom of the work and other glazed parts After cleaning, it is recommended to dry or ventilate where it is dry. ///// **About gifts |** https:////c1.staticflickr.com/5/4317/36041318496_930de6705a_b.jpg Encore offers free packaging services, please indicate the next single time__gift packaging__ * If there are multiple items, please indicate whether they should be packed separately or together * If not specified, it will be sent in a bubble cloth package Origin / manufacturing methods Made in Taiwan | Handmade ///// **About ANCO ANCO. |** https://c1.staticflickr.com/5/4306/35934402672_00f63dba6b_b.jpg "Encore" is a combination of two creators' names. Every piece of work is two of us, four hands one by one, Want to inject our feelings in daily life into your work and share it with you. With the changes in the feelings and ideas of life, and the endless changes in clay, the work will change. So please include us with a variable number of works (sometimes need a little waiting room), sometimes the inspiration will be a small change, sometimes feel that you have to move forward and maybe stop producing certain items. So don't hesitate to take them home if you like :) With your/our support is the growth of Anke.